Not sure if your home is in need of roof repair or a complete replacement? Contact Kramer Construction today to schedule a FREE roof inspection! Your roof is arguably the most vital piece of your home–it protects you and the structure of your home from the elements, extending the longevity of your home and protecting the health and well being of its inhabitants. If your roof is more than 10 years old, is starting to sag, or is showing other signs of aging or disrepair, contact the professional roofers of Kramer Construction today to schedule your inspection. We will give your roof an honest assessment to determine whether you need to have your roof replaced or not. If you need a roof inspection in Charleston, Mt. Pleasant, or the surrounding Low Country that includes Berkeley and Dorchester County, Kramer Construction is ready to provide you with valuable information to help you make the best decision for your home. Unlike other roofing companies, we offer free roof inspections because we want to be your go-to company for your next roof replacement project! There are plenty of reasons why “a roof over your head” is so important. Not only is the roof a home’s first line of defense against the elements, but it also has an incredible impact on the curb appeal and beauty of your home. Small roof problems can quickly escalate into expensive disasters, so it’s important to watch for signs of damage. 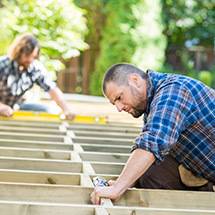 And because we live in an area with plenty of severe weather, it’s especially important to get regular inspections from one of the state’s leading roofing companies. As a safe bet, we recommend an annual roof inspection. Our roofers have seen many homeowners get surprised by excessive roof damage — even when the roof was inspected just a few years earlier. Severe weather has swept through your neighborhood and damaged your roofing or neighbors’ roofing. 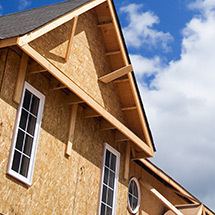 Similar homes in your neighborhood have been needing roof repairs lately. 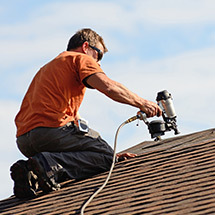 Missing shingles, broken shingles, or sagging can be spotted from the ground. Using binoculars, you see signs of damage such as curling tiles, cracked shingles, or patches of mold. Gutter runoff has asphalt sand or other bits of roofing material in it. Ceiling damage or attic damage may be coming from a leaky roof. Homeowners can check for many of these issues on their own. Just be careful and don’t climb up on your roof unless you have a safe way to do so. Besides the risk of falling, you might damage your roofing when walking on it. Let us, the bonded and insured roofing contractors, do the climbing. Kramer Construction offers free roof inspection, so there’s no harm in having a professional roofer look for damage. We hope to report zero damage, but we’ll give you an honest assessment of any problems we find. By getting regular inspections, we can tell you the easiest and best ways to correct problems so you can potentially stave off a full roof replacement or further damage to your home and belongings inside. Moss and mold grow quickly. Remediating a patch of growth is far less expensive than a roof replacement. 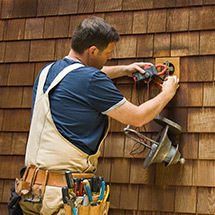 Missing shingles expose your home’s interior to water damage during the next big storm. Home energy efficiency can be reduced by roofing with holes, leaks, and damage. Resale value plummets for homes with visible roof damage, or when an appraiser finds the roof to be needing repairs. Protect your roof, your property, and your family with a routine roof inspections from the local experts. Get in touch with Kramer Construction to schedule your next appointment!